2018 is rolling along and a lot of people are looking for some fresh hobbies. 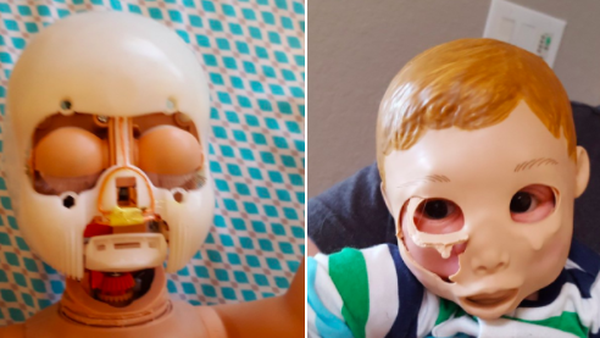 Have you considered cutting the faces off of dolls, then transplanting them onto other dolls? For one 7-year-old, at least, this pursuit is working out well — so well that an image of her handiwork (posted by her sister Katelynn on Sunday) has been retweeted 18,000 times. Yes, this image is deeply disturbing. Yes, it reminded me immediately of Dwight wearing the CPR dummy's face on The Office. But it's also awesome — Katelynn explained via Twitter DM that her sister is a big fan of playing doctor. "If my mom is sick or whatever, she’ll make ... fake IVs and oxygen masks to put on her. It’s funny," she said. Well, whether she ends up a general practitioner or a plastic surgeon, this kid has a bright medical career ahead of her. And now we know what the inside of doll faces look like!